Entries from Digital Intelligence tagged with "world of warcraft"
Oculus Rift, the virtual reality firm bought by Facebook for $2bn last month, has revealed its ambitions to create a massive game world populated by as many as one billion users. World of Warcraft has lost more than one million subscribers in the first three months of 2013, as gamers leave for free to play alternatives. Online game World of Warcraft was hit by a hack attack that used an ‘instant kill’ exploit to wipe out thousands of in-game and player characters, turning several cities in the game into temporary graveyards. World of Warcraft to go mobile? Activision Blizzard, the developer of world’s biggest MMO World of Warcraft (WoW), has announced that it is looking at porting WoW to mobile devices. Senior WOW producer John Lagrave, speaking to Eurogamer at Blizzard HQ last week, outlined the challenges involved, but added that the company has still not given up on delivering its game World of Warcraft to mobile users. 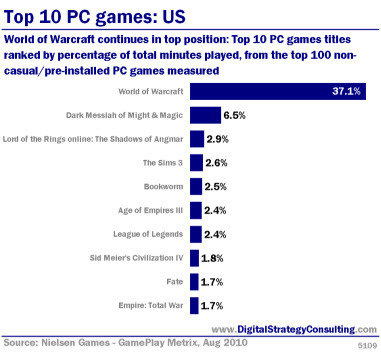 World of Warcraft continues in top position: Top 10 PC games titles ranked by percentage of total minutes played, from the top 100 non-casual / pre-installed PC games measured. 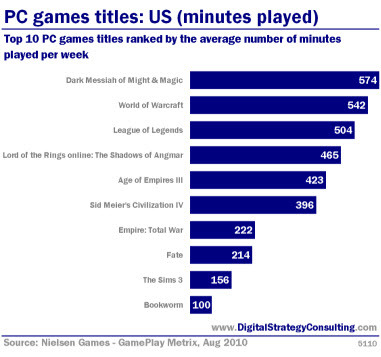 Top 10 PC games titles ranked buy the average number of minutes played per week.